Yay! 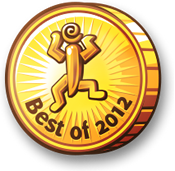 In the Best of Casual Gameplay 2012 awards, The Sea Will Claim Everything was voted #1 in Narrative, The Fabulous Screech was voted #1 in Interactive Art or Experimental, and Traitor was voted #2 in the Shooter category. This has really helped to cheer me up after these last few extremely depressing and discouraging days. The Best of Casual Gameplay awards may not be as prestigious as some of the big indie awards, but they do mean a lot to me, because I know that a lot of the people who enjoy my games have found them via Jay is Games, and the fact that this audience voted for my games feels significant. People often sneer at “casual gamers”, but in my experience they are far more open to intellectually and emotionally challenging work than any other group of gamers (to the limited degree such things really exist) I’ve encountered. Perhaps it’s because they are less interested in debates about theory and more focused on experience. Or maybe I’m wrong, who knows? But I’m grateful either way. Now back to writing about Ithaka of the Clouds.